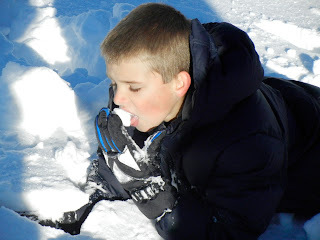 This is the second post of our family snow outing to Greer, Arizona. If you missed the first post you can check it out here. In the first post there are some ideas for making the most of your family vacation together. Caravanning as a family. two (four way for us) way radios, crafts, snacks, meals, and more. On our second full day in Greer it was all about eating a hearty breakfast, bundling up in our snow gear, packing our lunches, and getting outside to play in the cold white stuff! The Greer Lodge loaned us all kinds of tubes for sledding. Once all of our vehicles were filled to capacity with the tubes it was a short drive to a great public sledding hill. The snow was about knee deep and the day was sunny. A perfect day for snow play! Where are your sunglasses buddy? Cousins taking a break while crunching on snow. Just before my camera and I were wiped out! A tube just his size! I can't wait to see what he captured! We were everywhere on that hill. The wisest of our bunch! As our day was coming to an end I was in the car with the wise one so that she could warm up. I watched from afar as our entire clan worked together to link all of the sleds, tubes, cousins, and parents together to create a sledding train. It was so much fun that they did it again and again. It was a very symbolic way to end our day of family snow play. What a wonderful time! You have such an awesome family. Funny that there seems to be more snow fun in Arizona than in Colorado! I'll have to let my AZ-living daughter know that Greer is THE place to go for sledding fun. Looks like an awesome time!